For student Andrea Romero, success can be found through the Department of English’s technical communication track and the connections she’s found along the way. Andy Romero (right) at a Technical Communcation gathering. 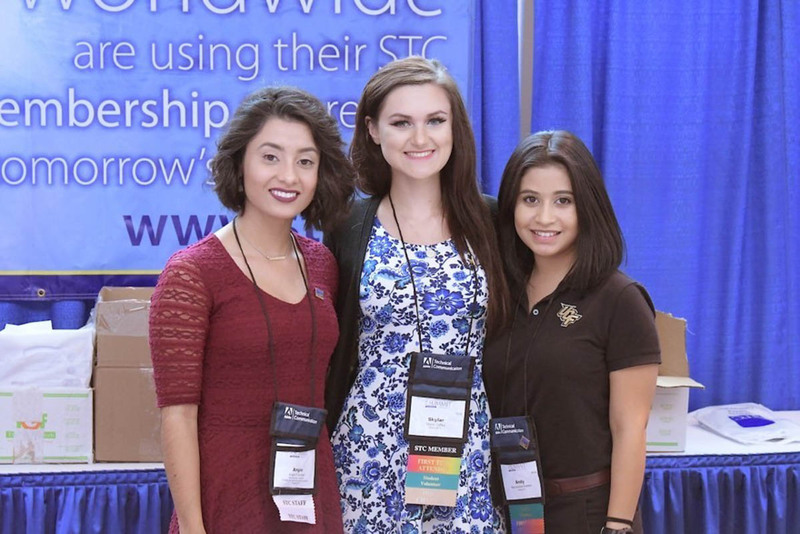 Being president of the student UCF Future Technical Communicators, a full-time technical communication student and a full-time Lockheed Martin employee is a heavy load, but Andrea Romero says it’s worth it. FTC provides future technical communicators at UCF with career guidance and partners with the Society for Technical Communication, the world’s largest technical communication organization, to offer a mentorship program for technical communication students like Romero. As president of FTC, Romero has not only helped grow the program, but has been a mentee herself. It was also through FTC that Romero learned about the Lockheed Martin College Work Experience Program, which places full-time UCF students in year-round, paid positions at the global security and aerospace firm. Last year, Romero did technical writing and development as part of the program, which led to Lockheed Martin offering her the full-time position she has today. “Everyone there is so open to diversity and accepting of new people,” she says. Students can stay up-to-date with FTC by joining its Facebook group. The UCF Lockheed Martin College Work Experience Program is also seeking applicants. Visit to apply to the program today.